The Semitic Aramaeans, former pastoralists in northern Syria and northern Mesopotamia, occupied various areas in ancient Syria in the eleventh and tenth centuries BC, once the Assyrian influence of the 'Middle Kingdom' which was keeping them at bay had faded. One such group took a former Luwian stronghold in northern Syria which may have been known as Masuwari, thanks to local inscriptions that were written in Luwian. However, Masuwari may instead be the Luwian spelling of the name of a region that was known as Muşri (Musri) in some Middle Assyrian texts, and the stronghold may also have borne that name as its key garrison. The Aramaeans may have gained the entire (relatively small) region along with the stronghold and they named it - seemingly after their leader - as Bit Adini (modern Tell Barsnip - the village of Tell Ahmar/Tall al-Ahmar actually stands on the site). The Beit Eden version of the name is the one used in the Old Testament (Amos 1:5), during the exposition of the words of Amos, one of the shepherds from the town of Tekoa (a small town in the highlands of Judah, ten miles south of Jerusalem) during what is generally assumed to be the second half of the eighth century BC. However, this may instead be a mocking name for Damascus, meaning 'city of delight'. Within a century or so the new Aramaean rulers of Bit Adini had formed a tribal city state which held some importance during the ninth century BC, although its existence is very poorly recorded. 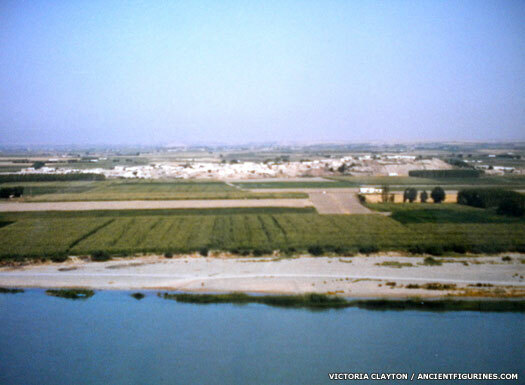 The city was situated on both sides of a crossing point on the Euphrates which was probably already in use, and would therefore be an ideal place to control trade between the Levant and Mesopotamia. At first, Bit Adini may have been controlled by the city of Hamath. Bit Adini, on the eastern border of the territory of Carchemish (although about twenty kilometres south of the city itself), may achieve independence around this date, if indeed it has at all previously been controlled by Hamath. A former Luwian stronghold, it has been dominated by more recent arrivals - Aramaeans - for up to a century. Adin, its eponymous 'founder' may not be a ninth century figure - his name could have been connected with his growing clan as their name for as much as two centuries beforehand. Founder of the Aramaean stronghold? Renamed it? Son or tribal descendant? Made Bit Adini a principality. A man from Bit Adini is installed as king in the rebellious city of Suru. He seems to be unnamed but two dynasties are earlier known to have completed for control of Masuwari itself. What may have been the legitimate dynasty (possibly Aramaean) seems to have been overthrown by a usurper (almost certainly Aramaean) whose son, Hamiyata, had promised to restore the rightful heir to the throne, and his own son had been unable to overthrow that decision by force. Where this leaves Akhuni in terms of the line of descent is anyone's guess by this stage, but it is possible that one of the less fortunate contenders for command of Bit Adini could now be sent to command Suru. The use of the Luwian Masuwari (and Luwian script) for the inscription that relates this story could be a traditional practice that has not yet accepted the change of name to Bit Adini (and the Aramaeans have no written script of their own with which to replace Luwian). Bit Adini becomes involved in the Assyrian hostilities against Laqe. The following year, Assyria leads a punitive campaign against Bit Adini's fastness of Kaprabu which lies to the east of the Euphrates. Bit Adini's ruler, Akhuni, is first mentioned at this time, when he submits to Assyria and pays tribute. Ashurnasirpal II crosses the Euphrates with his Assyrian army, erupting into Syria and completing his conquest of much of it. The Assyrians are now the dominant force in the region, despite attempts to peg them back, but now Ashurnasirpal takes further tribute from Akhuni. The Assyrians under Shalmaneser III conquer Bit Adini after a series of campaigns against a coalition of Aramaeans and neo-Hittite states. It becomes their provincial capital under the name of Kar-Shulmanu-Ashared. The ruling family is apparently removed from power, although their fate is unknown. An Assyrian governor is installed in their place, although this may well be the same person, sworn to loyalty. Shalmaneser then takes his army north and east into Urartu to combat that threat to his northern borders. After conquering the strategically important city of Bit Adini (otherwise known as Till Barsib), the Assyrians made it a provincial capital and garrison town. At least at an administrative level, they renamed it with an Assyrian name (alternatively shown in modern sources as Kar-Shulmanashared, which meant 'Quay of Shalmaneser') and installed an Assyrian governor, or at least a pro-Assyrian vassal. The city's name at the local level may still have been Masuwari, although Til Barsib also persisted in general use. The city itself was already thoroughly Assyrianised, and now contained an Assyrian garrison. The palace was decorated with frescoes representing the same type of scenes that could be found in stone reliefs at Kalhu, one of the Assyrian capital cities. Unknown Assyrian governor or governors. Father of Shamshi-ilu. Assyrian governor? Assyrian regional governor. Son of Gayah? Shamshi-ilu (possibly the son of one Gayah who is otherwise unknown) is perhaps the most powerful man of his time, one of a small group of almost equally powerful magnates - princes who govern Assyria under the sovereignty of Adad-Nirari and his three immediate successors. Making Kar-Shulmanu-Ashared his base (otherwise known, possibly, as Masuwari, and generally as Til Barsib), he campaigns west of the Euphrates on his own behalf without reference to the king. The scope of his actions and the tone of his inscriptions would seem to make him more than a provincial governor, and his conquests around this time include the once-powerful Damas. Assyrian governor of Masuwari under Shamshi-ilu? Ninurta-bel-usur seems to be of local origin, and he uses a phraseology that is very similar to that of a ruler. It is quite possible that Masuwari-Bit-Adini's local rulers had been left in place following the Assyrian conquest, while Shamshi-ilu remains free to campaign far and wide in defence of Assyria under his own semi-independent terms. Urartu has been continuing a series of conquests, being victorious against Assyria and conquering the northern part of Syria, and making Urartu the most powerful state in the post-Hittite Middle East. However, Shamshi-ilu does score a victory in battle against Urartu before 745 BC, as is recorded by a report on inscriptions of stone lions guarding the gateways at Kar-Shulmanu-Ashared. It makes no mention of his master, the Assyrian king. Tiglath-Pileser's ascension to the Assyrian throne marks a change in how the empire is governed. He rules in a far more direct fashion than any other Assyrian king of this century, taking personal command of the various campaigns and removing the princes who had taken so much authority upon themselves. The indirect governance of Kar-Shulmanu-Ashared as a base for Shamshi-ilu, the all-but independent Assyrian king of the west, is also ended. With the fall of Assyria, Barsib is now controlled by Nabopolasser of the new Babylonian empire. It never regains its former importance, but it does seem to retain the popularity of its Aramaean name in favour of the imposed Assyrian one, with Til Barsib now being known as Tell Barsnip (a tell being a mound that had formed the foundations of a settlement or which forms the only remains of it). The site today is largely under water, or at least three sides of it are, but new archaeological information may still be gained thanks to ongoing investigations by the University of Liege.